For High production of thermal/flame finish, anti-skid texture. 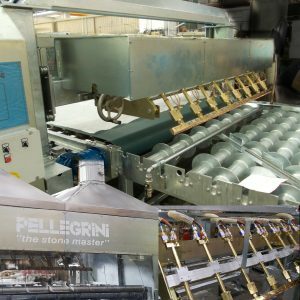 The continued evolution of engineering for rough surfacing lines while maintaining the reliability expected with the Pellegrini name. High production and adjustable according to slab size and finishing types. Even for tiles and strips, high precision flaming as well as low consumptions. The additional protection cover for the flaming torches, together with the powerful washing and drying systems, complete the line. The structure allows an easy access for maintenance. The best solution for high production of flaming operations. Automatic plant for the continuous flaming of thin and thick slabs. Equipped with eight flaming torches feeding 136 nozzles displaced in a comb configuration and on an oscillating bridge to produce the best distribution of the flame. The height and the inclination of the flaming torches are adjustable according to the thickness and type of material to process. Each group of nozzles is controlled by its own gas unit and all of them are fed by a single electrical control panel. The flaming area is protected by a steel cabin and preset to be connected to a smoke and heat extractor. On request, we can equip the plant with a slab thickness detector to automatically adjust the height of the flaming torches and/or with a width reader system to set each flaming torch to optimize the production and reduce the consumption.